Daily Illuminator: This Is One Spirited Sourcebook! 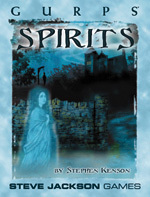 May 6, 2013: This Is One Spirited Sourcebook! What's that tingling on the back of your neck? Is it anticipation of the latest classic GURPS release on e23 -- or a sign of something more? Unravel this enigma with the ethereal (digital) version of GURPS Classic: Spirits. It's your one-stop spectral shop: a guide to the other side, a catalog of the spirit world, and a campaign compendium for those who would inspect specters or invite the wrath of wraiths. If you want information on inhabitants of the hereafter, then GURPS Classic: Spirits must be what you're here after!